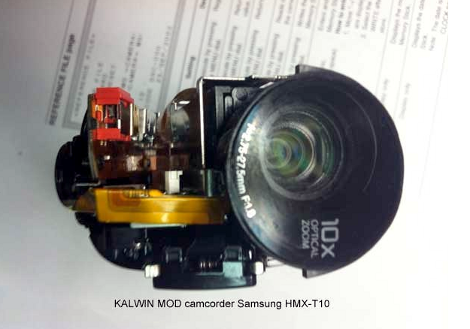 [Kalin] loved the picture from his new Samsung HMX-T10 camcorder, but the sound quality didn’t match up. Since it records video that can be directly imported to his editing suite of choice he didn’t want to just buy a different model, so he cracked it open and added an external mic input. As with most consumer electronics these days, the hardest part of the hack is getting the thing apart and assembling it without any damage. [Kalin] had to get down to the bare circuit board to get to the audio input connections. He soldered up some shielded extension wire to an audio jack, then made some space in the case by cutting a bit of the plastic structure before finally gluing it in place. Details are a bit scarce, but it looks like he wired up the jack along with a couple of switches. We’d wager this still lets him use the stock microphone if he doesn’t feel like hauling around extra gear. the link to the article is incorrect! There’s something wrong with the link. It points to a https version of hackaday (https://hackaday.com with a certificate for *.wordpress.com). And over there, you see the article about that underwater ROV. The link (https://hackaday.com/?p=50296&preview=true) takes me to the ROV article. Mono? How boring. We have had stereo since 1881! If stereo it’s perfect for pluging in a binaural head for the ultimate in sound capture, what holeywood can’t do with all of the fakeing and 5 tiny plus one bass speaker can’t. 5 eared aliens! I would bet that one or both of the switches cut in a gain reduction. Most camcorders can’t record anything louder than a folk singer and acoustic guitar, without cliping. The jack should do the switching off internal mic. It’s recording both from internal and external mic, so that he can mix ambient noise and speech of interviewed person. In case something doesn’t work out with external mix, he still have recording from internal one. Jack SHOULD turn off internal mic, but he changed it so that he can record from both channels if he wants to. This has always been a pet peeve of mine. I also happen to have a Samsung camera, and it bugs me to no end that nothing that comes out of loudspeakers can be recorded with it. And I mean _nothing_ – any stage performance, however quiet, comes out garbled way beyond recognition. This is just sad. Especially because my earlier camera happened to be from a different manufacturer and – guess what – could record _concerts_ just fine; not anywhere HiFi obviously, but you could clearly hear / identify the music – whereas with the current one all you can tell that _something_ must be awfully loud. Serious kudos for Kalin for having the moxie to actually take a camera apart and do something about it. Agreed, it’s so annoying how much crippling of functionality there is done, but I think it might have to do with various rules across the globe and additional taxes, like how in the EU if a digital camera can do video longer than x minutes it’s ‘competing with digicams’ and gets a tax hike, causing euro models to be limited in recording time, and how in the EU when a media player has FM radio it also gets a tax hike, and at one time LCD monitors got a tax hike if they had HDMI connectivity, so many crippling rules that do more harm than good. The lacking a line/external mike input might be something the mediamoguls have bribed the politicians into enforcing, maybe they figure that if you can record from an external source you could record from CD/radio/etc. and then the manufacturer has to pay additional taxes. Although I think it would work for them to make the things slightly more expensive and have such options anyway, people notice these things, but I guess that companies like samsung just want to be the cheapest option listed. Also; Hackaday uses HTML type formatting if I recall correctly. You reminds us that it would be nice in general when sites put somewhere near the editbox what format you are suppose to use. I sometimes try HTML on sites that go with propriety formatting and then everything gets messed up, and it’s hard to remember every site’s own peculiar system when you visit many sites and only rarely use formatting of text. Hi I am the author of the HMX-T10 mod. My real name is KALWIN not a “Kalin” :) . This mod is to connect only left channel to one external mic. I used to do this before with “normal” PRO camcorders. One channel is for microport the other is for audio effects. During the post production you can always choose which channel is most important for you or you can mix both. When I record an interview I always use MONO sound becouse it is sefer option with less noise. But I always mix that mono recording with “ambient sound of the room” in postproduction. In my opinion that way is to prevent any problems with broken cables, unexpacted noises etc. You can alway choose a “safe internal mic” audio in case of any problems. The other modification is to add a socket for headphones to monitor recording process. The problem was to activate a sound output in the camera’s PCB. I did it when I found which pin is to switch sound output mode. I need to do something like this with my Toshiba Camileo X100. The sound quality is fine, if you talk abnormally loud within 10 feet of the thing. Toshiba put a microphone I’d rather see on a laptop than a camcorder in the X100, so everything is about 10% of the volume it should be. Now I just need to get the guts to open up a brand new camera, and gather the funds to make a mouser visit. I love this mod. Anyone who’s not keen on opening up their machine but who is having trouble with eg wind noise could look at micromuff. I addition I have to say: there is also an internal switch for a mic socket. When the plug of external mic is out of my HMX-T10 works like a normal camcorder without any mod. I can’t believe the main article still doesn’t have a fixed link, I guess if we want it fixed someone should say something that alerts to troll-warning bot to get the attention of management, but I’m OK with the author and jamesoft having ‘fixed’ things via the comments.